Just thought i would share our new personalised bracelet with you all which we are very pleased about. Its a beautiful rings bracelet but with a bit of a twist, first of all we have used a sterling silver chain to string the rings onto to make it more secure and to add a bit more quality as i think it just looks better all round. I have then used sterling silver rings in which two rings have been soldered together to make one twisted ring which looks great. I decided to make the bracelet unique to IndiviJewels so i decided to add some gold vermeil rings to give it a contrast and also to catch peoples attention. Gold and silver always look so nice together just like strawberry’s and cream but it has to be designed in the right way so as not to look over bearing one way or the other so that’s why i added the gold toggle because if i just left it at the gold rings they just looked lost. This bracelet is a solid piece as the rings are big and sturdy not like all the lightweight ones where they are very small or look like they will break after a week that’s why the photo’s do not do it justice it looks much better in the flesh. 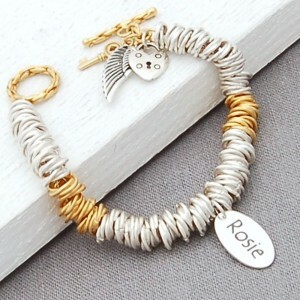 The great thing about this bracelet is you can personalise it which makes it different and unique to us and to you. This is a great keepsake to remember people past and present and to remember them every time you put it on or look at it you will remember the good times. 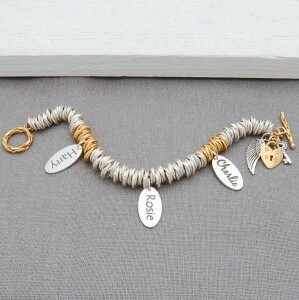 On the toggle i have added a little cluster of three charms just to make it look proportionate to the rest of the bracelet and to keep in line with our personalised range so you know its one of our pieces. Overall i don’t think you will find a better bracelet of a similar design than this one its just a timeless classic with a unique twist that makes it special. Ok that’s it for now i have got to go clean the floors and windows so i will leave you with a couple of pics of the bracelet. This entry was posted on Sunday, August 8th, 2010 at 11:22 am	and is filed under Handmade Jewellery, New Creations, personalised jewellery, Silver Jewellery.